Malachi is the last true prophet recorded in the Old Testament Bible. He came some 450 years before the time of Jesus, but with the full expectation that the Messiah was coming. In his time the people were in waiting for God – they have returned to their homeland, and slowly began to lead stable lives. They had to wait a for a long time before Christ arrived – but in this verse is the assurance that not only will the Messiah come, but with the use of several powerful imagery, it highlights the purpose and significance of that rising. But for you who revere my name – In contrast to the arrogant people who will reject God (as described in the previous verse), who will be set on fire on the day of judgement, or in contrast to the people who often rejected God, leading to the devastation in the times of the prophets before Malachi; for those who revere God, for those who fear God, for those who know his name, for those who understand God’s kingdom – there is a wondrous promise. 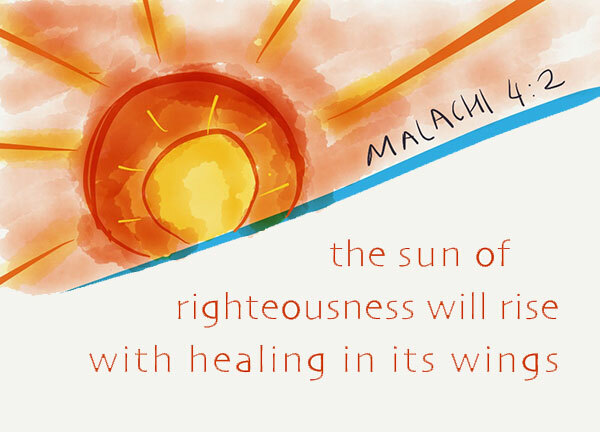 The sun of righteousness will rise – What a beautiful imagery this is. That Christ is a light to us is not an uncommon analogy used in the Bible – in fact, it’s very commonly used. Yet I personally feel that there is an added sense of beauty to this ‘light’ – The Messiah to come is like a sun rising – it was dark, but when the first beams of sunrays break through the darkness and illuminates the skyline, that is a wonderful scene. This sun is one of righteousness, and those rays are beams of righteousness that breaks through the darkness that we were in. It rises not to cause harm or prosecute. It rises on righteousness, and comes in righteousness. The Messiah comes to right all wrongs suffered by the people. The dark, oppressed, suffering life will be broken through by the rays of righteousness that is to come. with healing in its wings – Wings connote many things, but one of those could be protection – strong enough to allow us to hide under it. Logically, the ‘it‘ here refers to the sun. Just as an eagle spreads its wings, the suns spreads its brightness and gives us hope. It’s a beautiful sight. It’s awe-inspiring, it’s calming. It brings healing. In his years of ministry Jesus healed many people – even in his own hometown, where he was recorded to be unable to perform miracles, as a prophet without honor, it was still recorded that he healed people there. Not all diseases and pain may be healed in this lifetime, because healing in this lifetime doesn’t always best glorify the Lord. But even though not all illnesses and injuries will be healed in our lives, Jesus brings salvation, which grants eternal life – where there will be no pain, no illnesses, no injuries. It may be some time into the future, but with salvation comes healing. You will go out and leap like calves released from the stall – we will be free. Jesus came to free us, not to tie us down further. He grants us true freedom – a freedom rooted in God’s grace, a freedom rooted in God’s righteousness – most importantly, a freedom that grants us peace and joy. We’re no longer bounded to the law. We are no longer unable to free ourselves of sin. And in our freedom we will be energetic, with life, like young calves. When the stall is finally open, and the calves finally get to come out, they will leap out – not walk out. They won’t even run out. They will leap, because it’s such a wonderful thing to happen. Without Christ we would be like the calves locked in the dark stalls – staring minute after minute at that gate or door that obstructs our path to freedom, happiness and peace. The moment that gate is opened, and they see the exit that they so crave, they will leap out in eagerness. We should be like that too. In Christ, we are empowered. Christ means a lot of things to us in the Bible. His coming as the word in flesh, his presence amongst us, the significance of Christ – it is enormous. In this verse a few were highlighted – the list goes on and on in other verses – He is the sun of righteousness with wings of healing. And he will rise. And we will rejoice. A prophet who lived 450 years before the time of Jesus believed this so wholeheartedly. What more us, who have the privilege of looking back at the life of Christ in retrospect thanks to the Bible. The sun of righteousness has risen. Let’s go out, and leap like calves in joy.